A good bumper for the PT 11 has been a priority since the beginning. We have seen lots of different dinghy bumpers over the years, lots of them falling off or the rails falling off because of all the fasteners used to hold the bumper on. 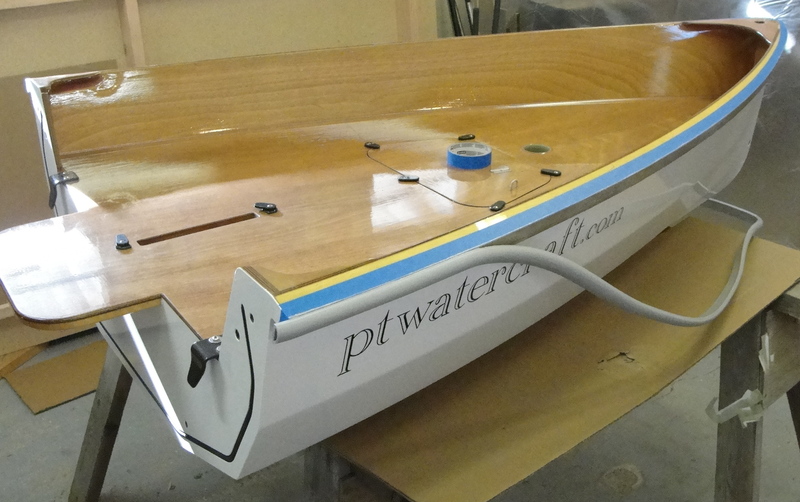 We know that bumpers on dinghies are a challenge and we have tried different types; the favorite being 3/4” braided nylon rope glued into a notch on the outside of the gunwale. This bumper but was very hard and probably quite heavy when wet, but it lasted over 20 years, and never came un-glued. 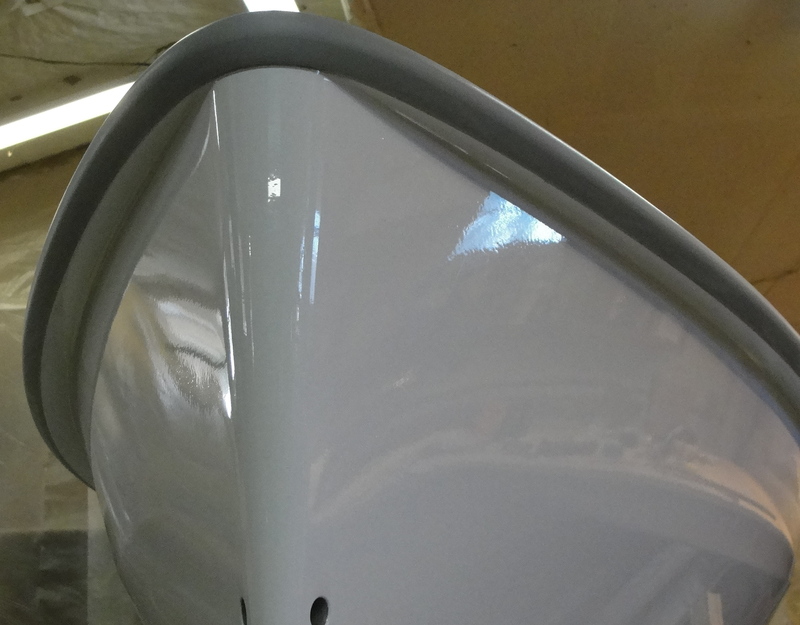 The gunwale on the PT11 (as well as the rest of the boat) has to be sealed against moisture intrusion for longevity, so installing a bumper with fasteners is out of the question, unless you are willing to replace the gunwale periodically. 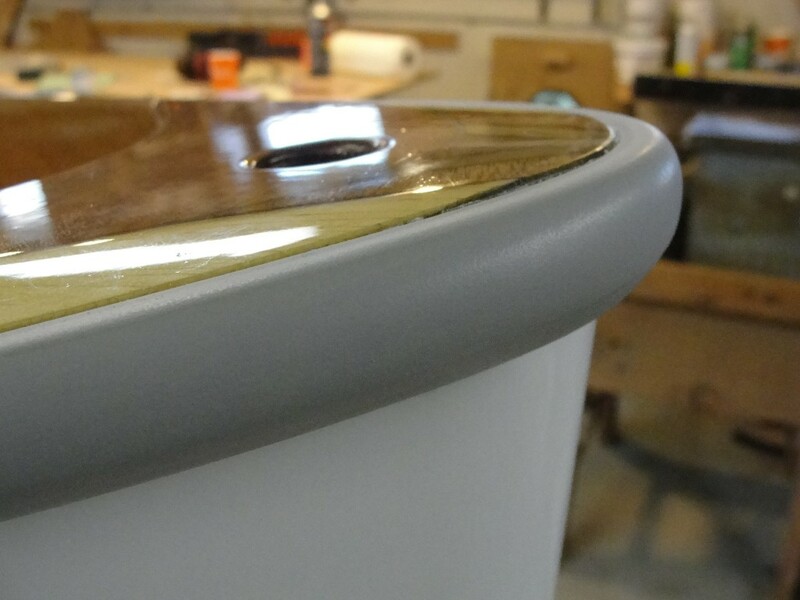 The most highly recommended dinghy bumper is a round closed cell foam covered with a fire hose like canvass material. This is usually attached with hundreds (I’m not kidding) of screws or ring nails, but could be glued on. See following photo. 1.How to finish at the ends. It can’t just be cut as the foam would be exposed and the canvass will fray. 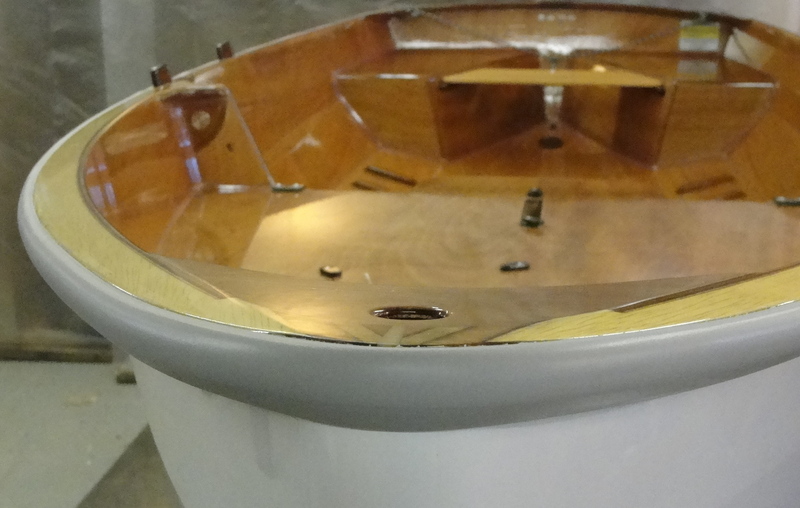 Usually the foam is cut short and the canvass folded over and sewn, but in a nesting dinghy this would have to be done at all 4 bumper ends at the joint between the hull halves as well as at the transom and would likely need fasteners at these points. 2. it adds to the overall width of the boat. 3. it would be difficult to install straight and clean and may not look so hot. All the above is to explain how we arrived at the glue-on extruded rubber bumper. We originally were planning a C-shaped section that would glue over the outer edge of the gunwale, but it would have to be glued on with something other than a contact adhesive and there would be challenges at the stem, transom, and in fitting around the oarlock riser blocks. 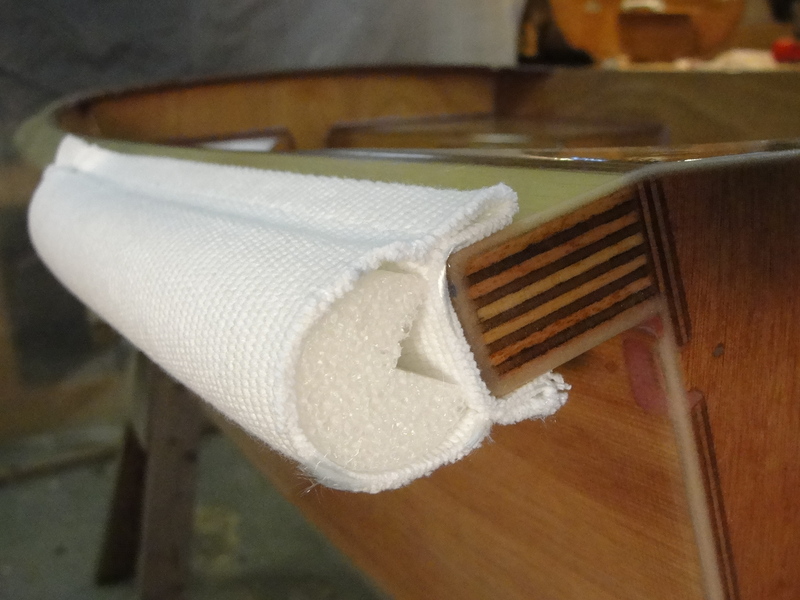 Thus we came to keeping the outer edges of the gunwale square and gluing a custom extruded bumper to the 1” wide flat present on the outer edge. The bumper shown in the following photos was designed by us for the PT 11 and made by a manufacturer who makes rubber bumpers (chafe guards) for inflatables. These bumpers are made from non-marking compounds and can be glued on with Hypalon glue, the same glue used to attach this type of rubber to inflatables. Gluing this bumper on to a PT 11 is a bit of a process. The hypalon glue is two-part, stinky, and must be applied in a dry area. Being a contact adhesive, no clamping pressure is needed, but you only get one chance to put the bumper on straight. Repairing sections of this bumper would be quite easy and could be done with a one-part contact adhesive. The die used to make our bumper will be modified slightly and another prototype made before we order the huge quantity necessary for a minimum order. An instruction booklet will be included with the bumper kits. This is my first experiment with time lapse photography and I am not altogether pleased. The gloss coat came out great but, time lapse isn’t like video, is it? With the time lapse, however; we get to cram an hour into 2 and a half minutes. What this does not show is the thorough de-dusting. The surfaces were first cleaned with a vacuum and brush attachment, and then gone over with clean cotton rags. Next were multiple light handed passes with a tack rag. Remember that if your tack rag shows dust on the surface, it means there is still a lot of dust left. Opening up the tack rag completely and lightly bunching it is the most effective usage. The reason we wanted to do a time lapse video is that this is a rather challenging part to gloss coat all in one go. Notice using a bristle brush and a narrow roller under the transom inwhale, and then shifting to a wider roller for the larger areas. Using a brush is asking for drips and it is a challenge to keep the coating thin enough that it doesn’t drip. The heat gun helps a lot in evenly brushing out a very thin coating of epoxy. The heat gun is set on low and always kept moving and well away from the surface. The other area where the bristle brush is used extensively is around the hardware and gussets. No matter how thin you brush your epoxy on, there will likely be drips forming below the taped off hardware. These can be picked up with the foam brush. 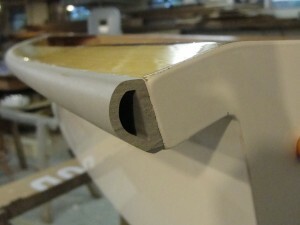 Notice that we start this operation by coating the holes in the transom inwhale and the bulkhead. Any drips that form from coating these holes will be picked up when the surfaces are coated.